A Buddhist chant is a form of musical verse or incantation, in some ways analogous to Hindu, Christian or Jewish religious recitations. They exist in just about every part of the Buddhist world, from the Wats in Thailand to the Tibetan Buddhist temples in India and Tibet. Almost every Buddhist school has some tradition of chanting associated with it, regardless of being Theravada or Mahayana. Daily practice in Nichiren buddhism is chanting the five character of Namu Myōhō Renge Kyō (homage to the true dharma of the Lotus Sutra). 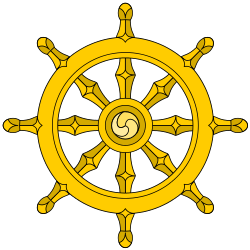 A Mahayana sutra that reveals the true identity of shakyamuni as a buddha who attained enlightenment numberless major world system dust particle ago. Kumarajiva's translation, which is widely honoured, is entitled the Lotus Sutra of the wonderful law (Myoho Renge Kyo). The mystic relationship between the law and the lives of the people courses eternally through past, present, and future, unbroken in any lifetime. In terms of space, the Nichiren proclaims that the heritage of the ultimate law flows within lives of his disciples and lay supporters who work in perfect unity for the realization of a peaceful world and happiness for all humanity. Nichiren practitioners will chant Nam Myoho Renge Kyo - the true aspect of all the phenomena and recite certain chapters from the Lotus Sutra, in particular the 2nd and 16th chapters. 1 2 Khantipalo (1982, 1995). ↑ For an example of Pali text and an English translation of this chant, see Indaratana Maha Thera (2002), pp. 1–2. To listen to this being chanted in Pali by Venerable Indaratana Maha Thera, go to http://www.buddhanet.net/filelib/mp3/02-chant-02.mp3. ↑ For the text, see Thanisaro (1997). ↑ For a bilingual edition, see, for instance, Indaratana (2002), pp. 32-34. To listen to this being chanted, go to http://chantpali.org/metta.html. ↑ "Smot Poetry Chanting". Cambodian Living Arts. 2014-01-22. Retrieved 2014-07-04. ↑ Gītassara Sutta (A.iii.250) from "Association for Insight Meditation" at "Archived copy". Archived from the original on 2007-11-21. Retrieved 2007-11-09. .
↑ Loori, John Daido (2007). "Symbol and Symbolized". Mountain Record: the Zen Practitioner's Journal. XXV (2). Archived from the original on 2010-11-15. ↑ Yasuda, Joshu; Anzan, Hoshin. "Gabyo: Painted Rice Cakes by Eihei Dogen Zenji". White Wind Zen Community. Archived from the original on 2008-03-07. Retrieved 2008-03-26. ↑ Loori, John Daido (1997). 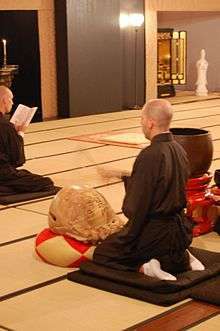 "Zen Mountain Monastery Dharma Talk". Mountain Record: the Zen Practitioner's Journal. Archived from the original on September 27, 2011. Indaratana Maha Thera, Elgiriye (2002). Vandana: The Album of Pali Devotional Chanting and Hymns (PDF). Penang, Malaysia: Mahindarama Dhamma Publication.